BERLIN--(Marketwired - Jun 6, 2013) - Following the core values and culture of the Marriott way, Arne Sorensen, president and chief executive officer of Marriott International, Inc. and Amy McPherson, president and managing director of Europe, recently visited the prominent Courtyard by Marriott Berlin City Center property. Touring what is one of the largest Courtyard by Marriott properties worldwide, the executive duo visited with employees of this modern accommodation in Berlin, putting into practice the philosophy established by the hotel chain's founder, J. Willard Marriott. "Take care of your employees and they'll take care of the guests," as was said by the founding Marriott, has long been embedded in the core values of the brand, and the recent visit by top executives to the Berlin business hotel is a testament to the continued respect the company holds for that enduring philosophy. Meeting and talking to back of the house employees across the world has been the standard for top executives of Marriott International, and was a treasured tradition maintained by J.W. "Bill" Marriott, Jr., whose steadfast devotion to employees was best expressed in his own words. "I want our associates to know that there really is a guy named Marriott who cares about them." Maintaining a leadership role within the company for more than 50 years Bill Marriott, Jr. has since handed the duties to Sorenson, but still maintains position within the company as executive chairman and chairman of the board. During their visit, Marriott executives witnessed first-hand the dedication associates of the impressive Courtyard by Marriott Berlin City Center exhibit daily in providing Berlin guests with exceptional hotel rooms and outstanding service. Featuring 257 guest rooms, 10 suites and 11 meeting rooms, the hotel with its convenient location near the Spittelmarkt subway station is an ideal destination for both business and leisure travelers. The hotel's flexible and state-of-the-art conference facilities offer space for up to 300 guests and are supported by a staff of dedicated event managers and capable culinary professionals trained to skillfully plan and facilitate the success of every occasion, whether hosting a corporate meeting or elegant social gathering. The Courtyard by Marriott Berlin City Center welcomes travelers to Germany with casual, yet elegant four-star accommodations in the heart of the capital city's downtown and near some of its most popular cultural attractions, fine shopping and delightful restaurants. Pampering guests with attentive service, W-Lan high-speed Internet connections and complimentary access to the gym and sauna, the hotel features well-appointed guest rooms and suites -- all furnished with luxurious bedding ensembles, a large work area and International cable/satellite service to combine for a remarkable hotel experience. 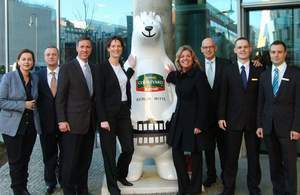 Arne Sorenson, President and CEO of Marriott International (third from left) and Amy McPherson, President and Managing Director of Europe for Marriott International (fifth from left) recently visited with the staff of the Courtyard by Marriott Berlin City Center. Find great deals and promotions for your next trip to Berlin! Take a photo tour of our beautiful modern accommodations in Berlin.